Artist Mary Price creates her art in Bristol, England. 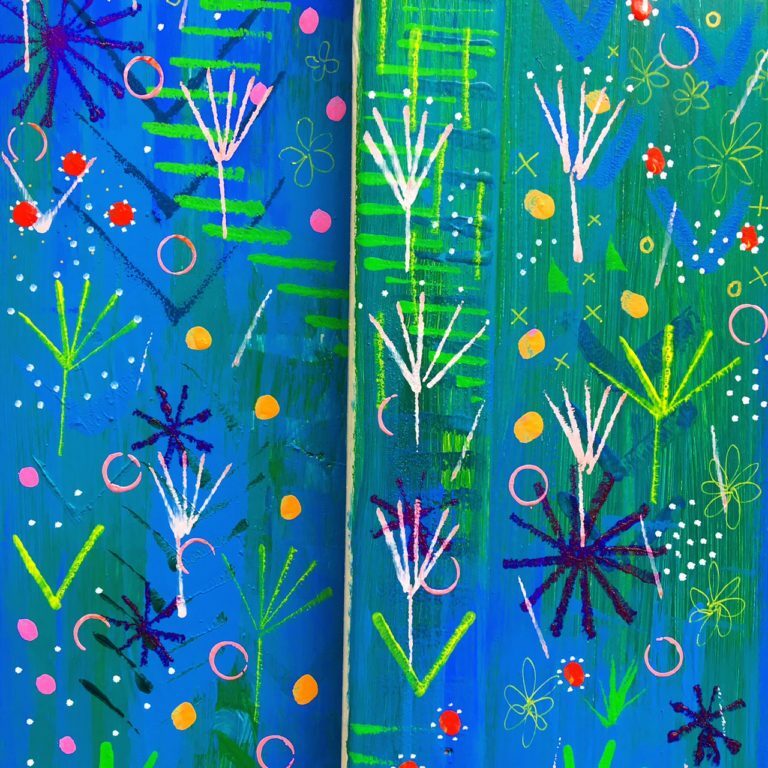 I was attracted to Mary’s paintings because of their bold colors, but also because you could see so many layers to them. 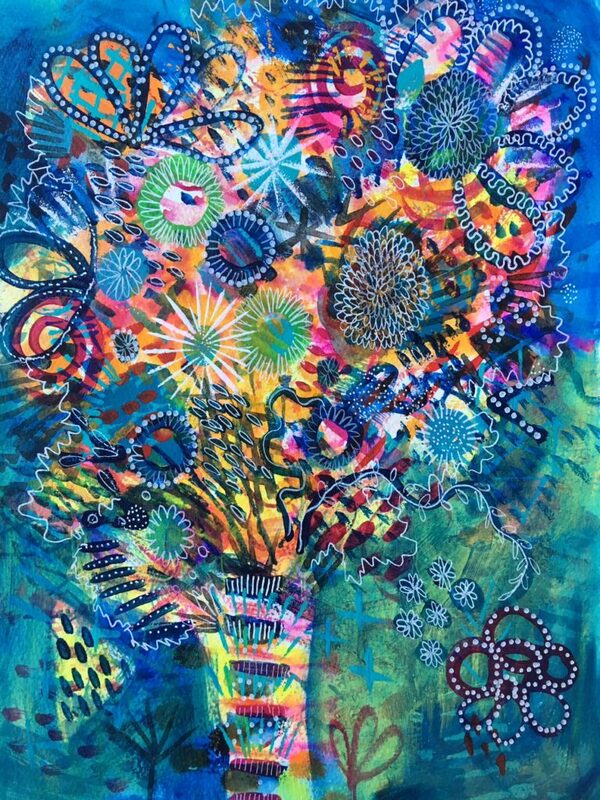 She builds up the color and design, pulling the shapes and images out to the forefront. 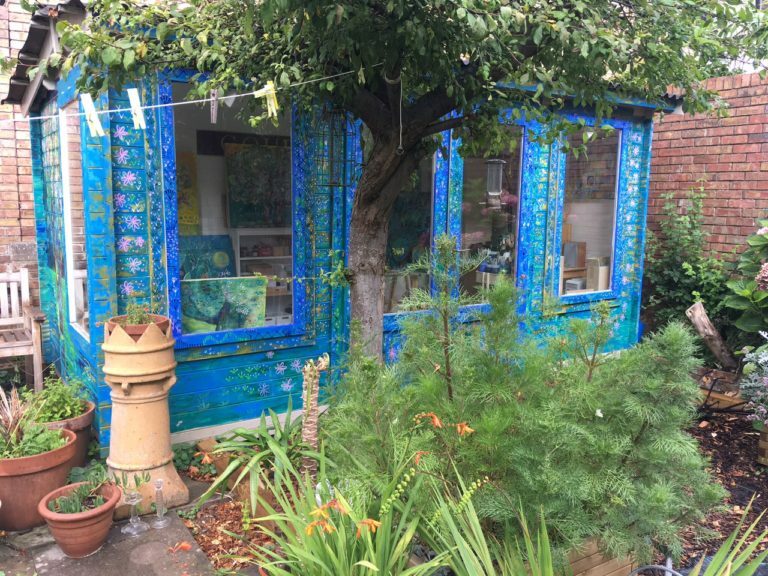 Mary creates her artwork in a shed in her garden, and in fact, her Instagram name is artistintheshed. She’s even painted her shed to look like one of her paintings, creating a studio anyone would love to paint in. 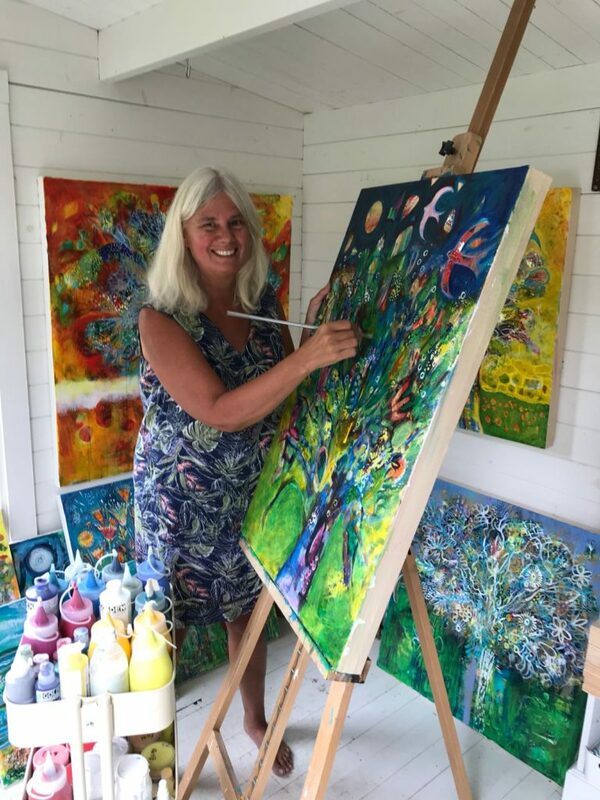 Mary Price, painting in her studio/shed in Bristol. 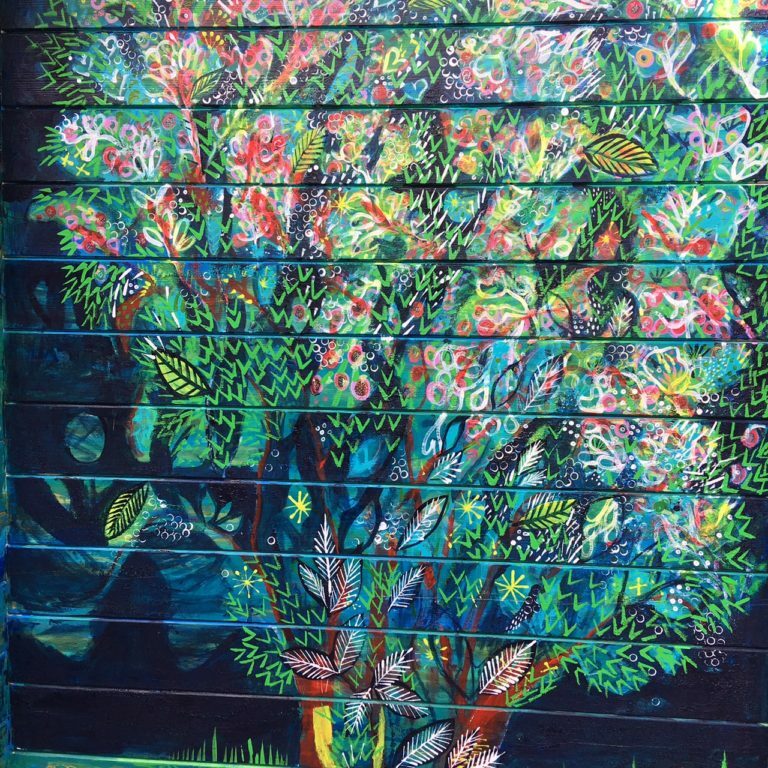 One of her tree paintings on the side of her shed. A closeup of her shed. Mary Price has called her website and her Instagram artistintheshed. Mary was inspired by the landscape paintings of Alan Cotton. Mary described a vacation when she stayed at the Lluc Sanctuary in Mallorca. You too can stay there and be inspired by the beautiful setting. Mary is currently showing her artwork at The Tobacco Factory in Bristol, England, through April 2, 2019. You can purchase some of her art at her etsy shop, and later she will be offering it on her website. If you’re hoping to inspire the young people in your life, keep art supplies on hand for them, like paints, paper, or a chalkboard. Instead of covering an old painting with gesso and starting over, just paint over bits of it, so you can keep the areas that you like. As you look at your world, think of how many colors you can see in one thing. Rethink how you see color, to recognize that while at first glance something appears to just have one color, in fact it really has very many colors. You can paint using all kind of mark making tools, not just brushes and pens. This might seem obvious, but you can put your art out there without the help of a gallery. You can do all kinds of self-promotion using social media. A way to connect further with artists you’ve met on social media is to do an art swap with them. It’s also an inexpensive way to add to your art collection. 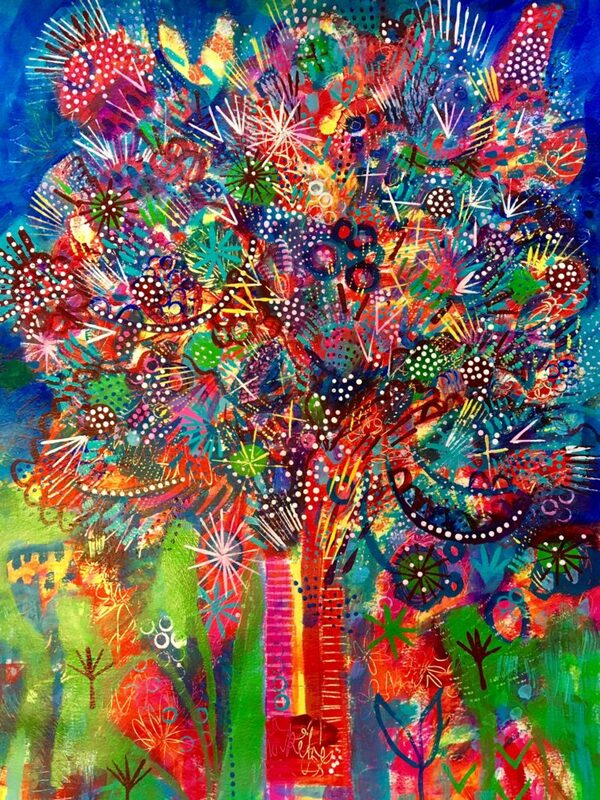 Mary described her type of intuitive painting beautifully. She places a load of marks on a canvas, and then responds to them and reacts to them and sees what happens. It helps that she paints in a free and loose way. Instead of doing a solo show, invite another artist to exhibit with you because it will be less work that way. If you need to get professional photographs done of your artwork, consider swapping artwork with a local photographer for this task.